There are only four sheep out on the coastal ground at the moment, I missed them when I gathered the flock last month, and had intended to retrieve them when I had a moment, I’d made the mistake of thinking that with only 4 on 200 acres they’s come to no harm….what a silly thing to think!! I had a call last week, to tell me that one of the ewes was stuck on the cliff above Grunta beach (named after the cargo of pigs that was once wrecked there) I took ‘Fly’ with me and walked down the steps to the cove, looking up I spotted the ewe, far closer to the top than to the bottom. We walked back up the steps and I would have gone straight back up to the path above the stricken ewe, if it had not been for Fly taking my attention. She had put her head down, ears up, and walked in a focused manner towards to top of the cliff 50 metres away, there she stood looking over the edge. There’s an element of two way communication between shepherd and dog, and this was certainly an occasion when ‘Fly’ was indicating something to me. I walked over and discovered that she was right. Below us on a shingle beach the other 3 stood, above the high tide mark, but obviously unable to climb back up. How Fly knew they were there is beyond me. They were completely out of site, the noise of the waves would have drowned any sound, so I guess it must have been scent. It was just another of those occasions that leave me in awe of sheepdogs, they are capable of so much more than I can ever train them to do. Fly and I climbed down and two of the three were easy enough to catch. With a bit of lifting, pushing and shoving they were soon back at the top. The third ewe was far more elusive and took off across the rocks and away. After a short pursuit we cornered her, and with rather more effort managed to lift her back to the top, which would have been fine if she hadn’t then joined with the 2, and led them straight towards the scree, below which the original sheep was stuck! It’s difficult to understand the mentality of sheep on some occasions, but this particularly cussed behaviour was undoubtably bought on by a ‘flight from danger’ instinct. For all four sheep to have been over the edge of the cliff, in two separate places they had to have been chased by a dog. I guess this ewe was still in fear and looking for safety. I left them for half an hour, as this is always the best approach for a sheep that is threatening to jump, and to my great relief the group of 3 decided against trying to join the original one. Slowly they turned and walked away from the edge. That just left the one ewe to retrieve, and with the aid of a rope and some help from my daughter Laura, I climbed down and we lifted, pulled push and dragged her back up. It took an hour or more and was a slightly hairy operation as she was stuck on lose crumbling scree, and the drop below was 100 feet. The ewe had a bite to the back leg, which was swollen and required attention. We took her home and she now appears to be recovering in the barns with the rest of the flock. 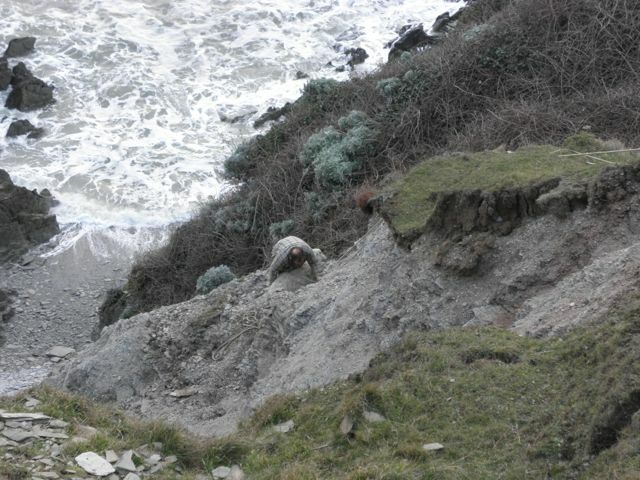 These incidents are sadly common place for those of us who graze the coast. 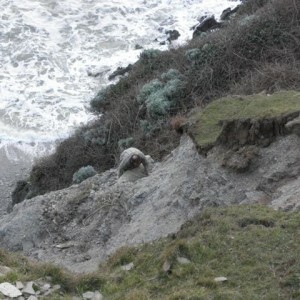 I find that the vast majority of dog owners are completely responsible, but in this case they must have known that the dog had chased sheep over the cliff, and instead of instigating rescue and owning up, their priority had been to avoid taking responsibility. All dogs possess that ancient instinct to pursue prey, and if an sheep runs in front of them, they become completely oblivious to calls of restraint, and thousands of years of genetic instinct takes over. So for me the request is, that if your dog hasn’t experienced livestock before and been proven not to chase, then for the sake of sheep, shepherd, dog and yourself, please keep it on a lead.